Energy tech company EA Technology has celebrated record sales for the year end March 2017. Topping £26 million, the Cheshire-based energy technology company saw orders increase by over 50% across nearly all of its global markets. EA Technology is a world leader in consultancy, products, services and training courses which enhance the performance, reliability, safety, efficiency and cost-effectiveness of power networks. Its customers include companies involved in electricity transmission, distribution and generation, together with private companies that operate power networks. Having had a record year, EA Technology is now in an ideal position to further benefit from the significant changes currently underway in the energy sector. The carbon and air quality agendas, the cost of energy, and new technologies are accelerating the rate of change in the energy market, providing big commercial opportunities for companies capable of changing quickly. Electric vehicles, electric battery storage and local generation of energy through wind turbines, solar and biomass are transforming the energy landscape. Homes, businesses and whole districts are increasingly in a position to ask if they can become more self-sufficient in meeting their energy needs. As smart meters create a deeper understanding about the opportunity to switch demand to low cost periods, so behaviours are changing. Linking a local wind farm with a major energy consumer can now be more cost-effective through the deployment of battery storage. 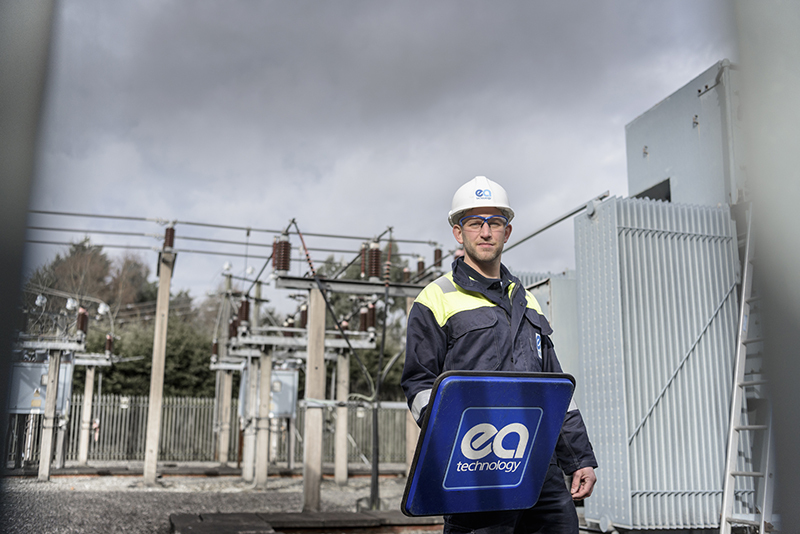 Two groundbreaking new collaborative projects that EA Technology is delivering with Western Power Distribution are creating huge interest in the industry. The ‘Electric Nation’ project, the world’s biggest electric vehicle trial, is testing a smart charging solution to the challenge of increasing numbers of electric vehicles charging at peak times on local electricity networks. The ‘Open LV’ project is developing technology that will provide open data from low voltage substations that can be used by a range of people and organisations, including local communities, to help keep energy bills low and to introduce decentralised, lower carbon energy. And the ‘Foresight’ project, recently launched with Northern Powergrid, seeks to evolve low voltage networks into ‘state-aware, self-healing’ energy systems with far greater reliability and safety. Having the most creative engineers and accelerating the rate of innovation are two of the key reasons behind EA Technology’s growth last year, both in the UK and globally, and the company is now offering a new service: investing in bright ideas for innovate technologies and setting up new commercial models with its customers. EA Technology has launched an all-new website which showcases its consultancy, products, services and projects, as well as its Power Skills training courses.